If you’re anything like us, you’d agree that the state of the world isn’t looking good. We have tensions all the way from the Middle East, and even tensions at home with the Trump presidency. So, why not prepare yourself in case of global catastrophe; you do want to keep your family and yourself safe, after all. If you were looking into ways to do that, then the Atlas Survival Shelter is exactly what you need. 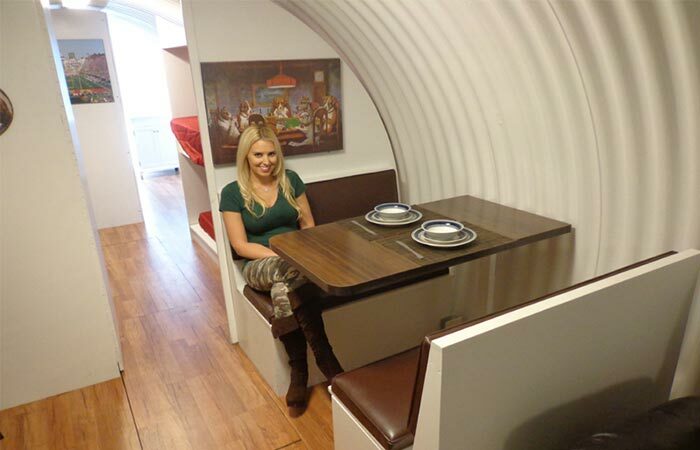 Designed in the same way as the military corrugated pipe shelters that were tested against nukes in 1959, the Atlas is assured to keep you and your family safe. The Atlas Survival Shelter offers every possible luxury; including a dining area, sleeping areas, a lounge, amenities, etc. The Atlas also comes with a variety of features that makes it one of the best shelters on the market. They are designed to be buried at a depth of at least 10 feet; this ensures that you’ll be safe from indirect nuclear blasts, chemical attacks, or biological warfare. They also have built-in military grade NBC air filtration systems, CO2 scrubbers, generators and high-tech electronics. Don’t miss out on the video below. The Atlas Survival Shelter features plenty of room for sleeping space, including a double bed in the main bedroom.